TheSamba.com :: Bay Window Bus - View topic - Double Relay Explained. . . In Color! Double Relay Explained. . . In Color! Posted: Mon Dec 22, 2008 10:23 pm Post subject: Double Relay Explained. . . In Color! Relays allow you to switch heavy duty or far away devices with light duty switches. In the case of the rear-engined VW, we get to instruct the starter to turn over the engine with a very light wire telling the starter relay to hook up the heavy duty battery cable with the equally heavy duty starter motor wire. The convention with generic German car relay numbering is that the power supply wire is designated #30, the destination wire is #87, the instruction wire is #86, and the ground wire is #85. In German car wiring diagrams, #30 is used not only on relays, but any time a wire is "hot". If your battery is hooked up and charged, expect full voltage at any #30 terminal you happen across. #15 is found wherever you get battery voltage when the ignition key is turned to the "on" position, that would include the #15 terminal on your ignition coil. #50 is used for any wire that receives voltage when the key is at "start." 1) Supply voltage to the fuel injection system when the ignition is on. b) when the engine has informed the relay that it is now running under its own power. Alas, it cannot be so simple. You will also see only little adherence to the German electrical system numbering conventions at the double relay itself. 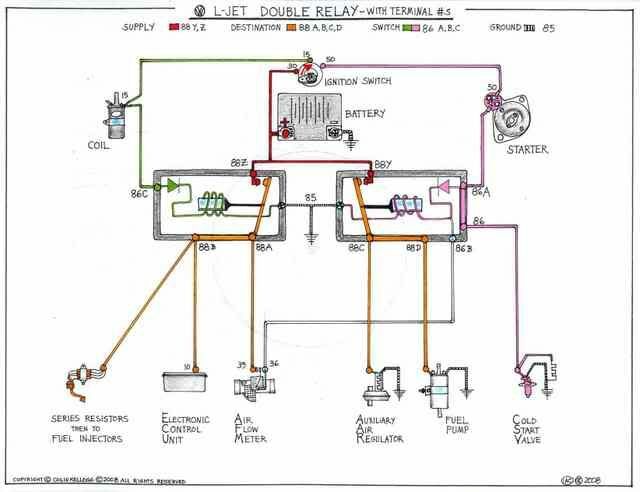 But if you compare the colors used in the above generic diagram to the colors below in the actual current path diagram of your Volkswagen L-Jetronic fuel injection system, you will see the simple functions of the double relay. The ignition circuit is colored in green and it instructs the *power* relay to provide voltage to the injectors, via the voltage dropping "series resistors", and the Electronic Control Unit. The starting circuit is colored in pink. It runs the *fuel pump* relay which supplies voltage to the fuel pump, and the Auxiliary Air Regulator. Let's run you through the sequence: First, we turn on the ignition. Power relay gets energized and the ECU and series resistors have voltage. The engine is not turning though, so we certainly don't need a fuel pump just yet. But, as soon as we turn the ignition key to "start" we need fuel pump and we need some cold starting assistance. (the ignition side is energized as above, but I have darkened the display to keep you focused on the starting side) With the ignition key at #50, voltage is supplied to the starter which is now turning over the engine. Voltage also continues to the double relay where the fuel pump relay is energized and connects supply voltage to the fuel pump and the Auxiliary Air Regulator (it only needs voltage to energize a timed heater). You will note (!) 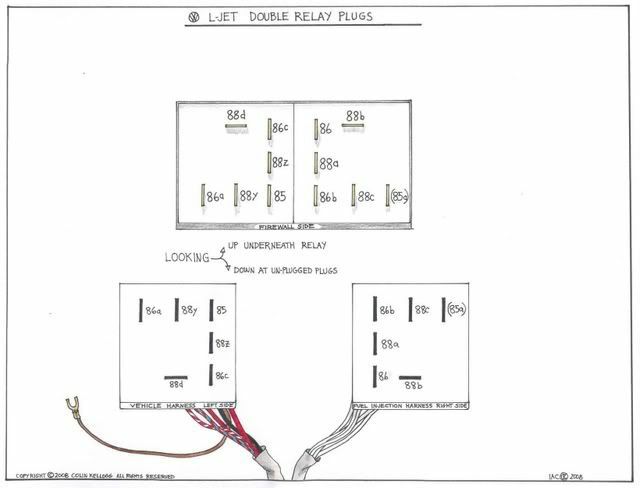 that there is another circuit that is energized OUTSIDE of the double relay function, the 86a > 86 terminals are "bussed" and voltage goes down to the cold start valve quite independently of anything going on inside the double relay. The cold start valve is limited to operating only when the starter #50 circuit is energized, and it shuts off when the Thermo Time Switch cuts the ground path. Like the Auxiliary Air Regulator, the Thermo Time Switch only needs voltage to energize an even faster timed heater than the AAR's. When the engine starts, we release the ignition key. The starter circuit drops out. The CSV and TTS are cut off as well. And inside the double relay, the fuel pump relay is going to want to drop out as well. . . . but, it doesn't. Thanks to the Air Flow Meter, which has determined that the engine is running all by itself, the power relay voltage that has been supplied to terminal #88a to the AFM all of this time, now gets to return to the fuel pump relay through 86b, illustrated with a shocking blue/red striped wire. There is a diode inside the relay that prevents the AFM voltage from running out to try to engage the starter and cold start valve, so all that happens is that the fuel pump and AAR are allowed to continue to run only so long as the AFM is reading air flow. 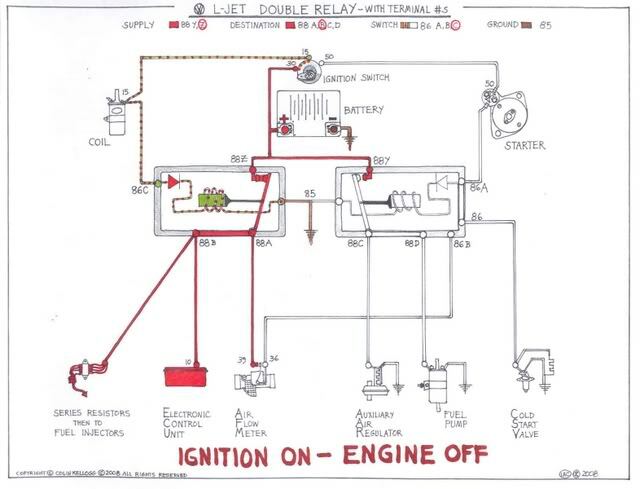 If you stall the engine, well, consult "Ignition On - Engine Off" diagram. Actual wire colors and locations are unfortunately not nearly so beautiful as depicted. This might be a good thing. All wiring in the L-Jet fuel injection system is white. 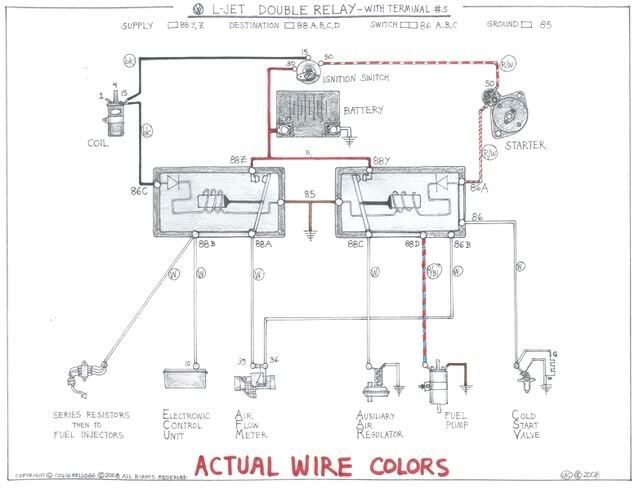 Vehicle wiring is color-coded. Now this is disappointing. After that nice elegant distribution of terminals in a logical way in all of the above diagrams, I have to show you the actual layout. It looks willy-nilly, but it is what VW/Bosch had to do to separate the vehicle harness from the fuel injection harness, and still get all the tracks and bus bars laid out inside the double relay. The view of the relay underside is as if you laid it on its firewall "back" side. The plugs are oriented as if you just pulled them off and stared down at them. The left plug is the vehicle harness, you can see multi-colored wires. The right plug is all white wires leading into their harness. People get confused trying to read the terminal designations on the relay and then transposing the correct terminal number onto the correct plug "slot", so here I have labelled both the double relay terminals and the plug terminals. Note that with the correct wiring colors on the preceding diagram, you can catch that blue/red wire on the left and know instantly that it is the fuel pump supply wire coming from relay terminal #88d. From here on out, you will know that if your car refuses to start readily when cold, you can double check the red/white wire from the starter solenoid #50 terminal to make sure it is sending voltage to the double relay #86a where it buses right back out from #86 to fire up the CSV Cold Start Valve. Enjoy. This is not terribly complicated stuff, just annoying when wires and terminals get all bunched up and you can't read designations. More to come. . . I'm looking at the schematic(s) in the Bentley. Our 78 Cali uses the 11 pin relay. I see 12 pins on the drawings. The difference being 85 and 85a which are grounds. No big. The 79 Cali uses a 13 pin. Pretty much the same except for power taken to the injectors for cylinders 1 & 2 and 3 & 4. Nice drawings. It's a real talent to be able to bring life into wiring schematics, and helpful too! 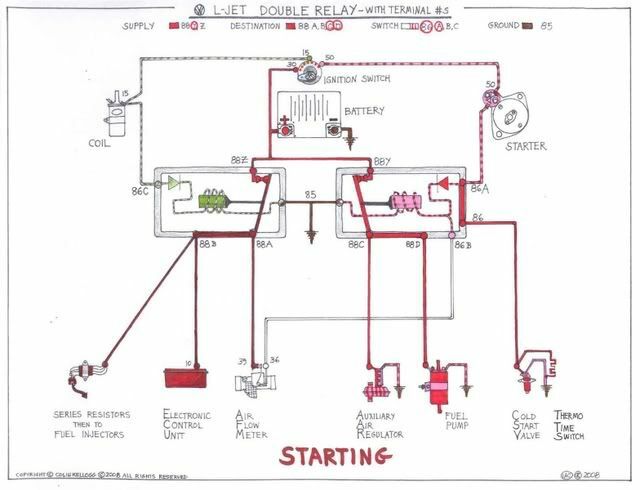 In the second drawing labeled L-jet Double Relay Simplified the cold start valve is wired wrong. It is not fed power off the relay at terminal 88d , but gets its power from the trigger circuit (#50) for the relay at terminal 86, as shown in the more detailed drawings. Wow Colin, very nice! At last, an easy to read explanation all laid out in color. So, when is your book gonna be out? Ya rope em slowly, Wildthings. That picture was just to get the conceptual flow established, that is why I used INCORRECT terminal numbering as well. . .
As I mentioned to Wildthings, I am most interested in people getting the concept down, and seeing how the factory answered the question, "how do we get the fuel pump to run during start and run only after the engine has proved that it is running?" Usually when current is flowing through a diode, the voltage on the positive leg is 0.65 volts higher than on the negative (the resisted) leg. Man, I am in the thick of it. I wonder if it will have a market if we continue to suffer this economy. Jobless and bored? Read this book about that classic car you don't want to sell with EZ On The Eye Illustrations. I dunno. Still working on it. Want it done! Seems like posting a conceptual drawing that is incorrect is kind of like roping a fence post. Causes that conceptual flow to come to a stop pretty quick. Amskeptic, thanks for the great posting. i could have used that a couple months ago. Give the guy a break. He has taken what many consider to be a mystery and broken it down so anyone can understand it. 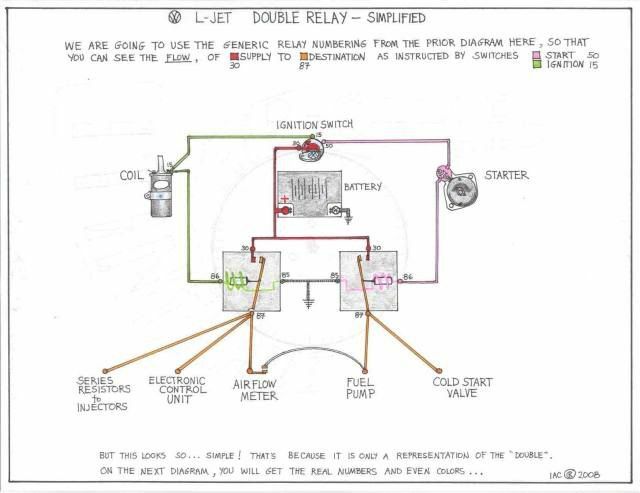 Amskeptic, you have done an excellent Job of describing the operation of the double relay. I am sure it will help many people understand it. very nice! but i'm just thinking to my self actual wire colors is kind of a relitive term as i wonder how many of my wires are og! hahaha! still very well written and clear graphics good job! Great post Colin, trying to explain electrics to some people is like describing color to a blind man and this really helps. Reading this post has suddenly resulted in an ah-ha moment for me. You know one of those moments where your brain suddenly connects totally separate facts into a revelation. I think I may have found the source of several of my troubles. My '77 Bus fuel pump runs continuously with the ignition on. I've always known this and never really thought much about it. Seperately, I've been having other issues... idle is poor until warmed up, and there's a hesitation when accelerating if I try to drive away right away, but then after a long highway drive it will sometimes die randomly at stops. Recently I took a long road trip and my MPG dropped each leg - 1st tank 17.5 mpg, 2nd tank 15.5 mpg, 3rd tank 14.5 mpg. Outside Temperature was dropping each leg also, and pulling into home with 11 degrees F outside the bus would occasionally die randomly at idle, then start right back up again. Exhaust smells rich at idle. I've replaced the Temp Sensor II, no change. 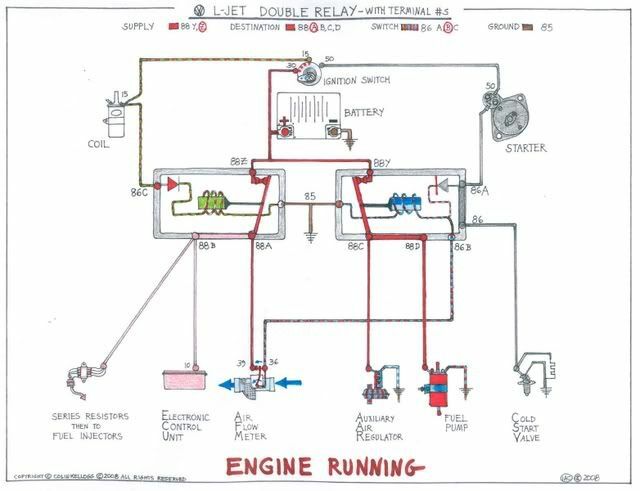 So now - looking at your diagrams - It occurs to me that if the fuel pump is always running due to incorrect starter wiring then the cold start valve may also be energized through the thermo-time switch. The TTS should shut the cold start valve off after 8 seconds BUT it's not intended for continuous use. It might let some current through, particularly if the temperature in the engine compartment is very low I'd imagine it would cycle on and off as the TTS turns on, heats, shuts off, cools, turns on etc, randomly killing my engine with extra fuel. Very nice explanation :0) thanks for the effort /contribution! I am not a FI type of guy but I do applaud Colin's drawings, not everybody out in the VW world is a 100% know-it-all and thank god not as arrogant as dan. allow me to be off topic by being more on topic- colin i think your drawings are outstanding- these and also i saw one about double-clutching- exceptional work. as an electronics kinda guy, i often do explanitory drawings or write-ups, and i understand the work that goes into it. yours are top notch. please people, don't let the thread get out of control. wildthings, dan, this has nothing to do with your vehicles or your expertise. it's about some cool drawings that colin posted. i think they're cool, yes. 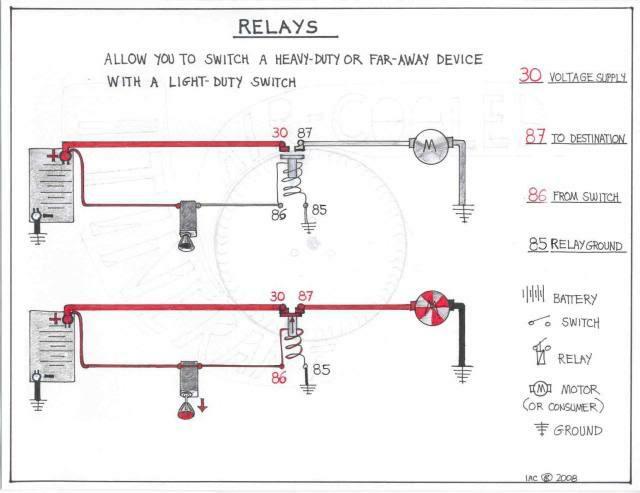 if the drawing of the relay has the wrong number of terminals or a wire in the wrong spot i'm sure colin will fix it. it was probably unnecessary to number the terminals at all, since it is just a simplified drawing, like a block diagram. the more detailed drawings below show the correct terminal numbers, as those are not a generic relay, but the VW dual relay we know and love/hate. on the other hand lol, regarding the CSV and TTS, i was under the assumption that the TTS controls ground for the CSV; that the TTS is a temperature controlled switch that interrupts the ground circuit for the CSV. if the TTS is open, theres no ground connection and the CSV cant fire. this is not really shown in the drawing, it looks like they are sharing a ground connection. i dont know that its really necessary to fix the drawing, as the focus of the drawing was the dual relay and not the components, but if you were inclined to fix it, its just a small detail.